Guild’s beautifully crafted and rich-sounding Orpheum series guitars come from the talented hands within the Guild Custom Shop. 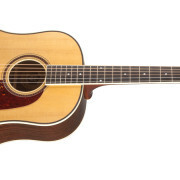 In traditional dreadnought, jumbo and orchestra models, each instrument stylishly evokes the golden 1930s-era of U.S. acoustic guitar design and construction. The Guild Custom Shop presents the beautifully crafted and rich-sounding Orpheum series “Slope 12” dreadnought acoustic. The Slope 12 offers a distinctive difference for the discerning player—sloping shoulders that gracefully curve away from the neck in marked contrast to conventional straight-shoulder dreadnought design. Further, its three-piece mahogany/rosewood/mahogany neck joins the body at the 12th fret, contributing to an abundantly complex yet warm and balanced tone that makes it ideal for flat picking and finger-style playing. Custom Shop solid red spruce top, solid mahogany back and sides, 12-Fret Slope-Shoulder Dreadnought. Available in Natural and Sunburst nitrocellulose lacquer finishes. The Slope 14 offers a distinctive difference for the discerning player—sloping shoulders that gracefully curve away from the neck in marked contrast to conventional straight-shoulder dreadnought design. Further, its three-piece mahogany/rosewood/mahogany neck joins the body at the 14th fret, contributing to a punchy yet warm and well-balanced tone that makes it great as both a lead and rhythm instrument. Custom Shop solid red spruce top, solid mahogany back and sides, 14-Fret Slope-Shoulder Dreadnought. Available in Natural and Sunburst nitrocellulose lacquer finishes. The Slope 14 offers a distinctive difference for the discerning player–sloping shoulders that gracefully curve away from the neck in marked contrast to conventional straight-shoulder dreadnought design. Further, its three-piece mahogany/rosewood/mahogany neck joins the body at the 14th fret, contributing to a punchy yet warm and well-balanced tone that makes it great as both a lead and rhythm instrument. Custom Shop solid red spruce top, solid rosewood back and sides, 14-Fret Slope-Shoulder Dreadnought. Available in Natural and Sunburst nitrocellulose lacquer finishes. This Orpheum model ranks among the finest Guild jumbo guitars ever made. Its Adirondack red spruce top with scalloped red spruce bracing, paired with solid mahogany back and sides using traditional hot hide-glue construction, projects full-bodied tone with a clear and powerful voice. Custom Shop solid red spruce top, solid mahogany back and sides. Available in Natural and Sunburst nitrocellulose lacquer finishes. The Orpheum Orchestra Model ranks among the finest Guild auditorium-style guitars ever made. Its Adirondack red spruce top with scalloped red spruce bracing and solid mahogany back and sides, combined with a three-piece mahogany/rosewood/mahogany neck that joins the body at the 14th fret, produce warm, balanced and articulate tone with rich bass and singing treble. The Orpheum Orchestra Model ranks among the finest Guild auditorium-style guitars ever made. Its Adirondack red spruce top with scalloped red spruce bracing and solid rosewood back and sides, combined with a three-piece mahogany/rosewood/mahogany neck that joins the body at the 14th fret, produce warm, balanced and articulate tone with rich bass and singing treble. Featuring a Red spruce top, solid mahogany back and sides, 2-piece mahogany neck with a soft “V” shape and ebony fretboard, this model delivers warmth and punch with a vintage aesthetic. Other standout and traditional features include the use of hide glue and an authentic bone saddle, nut and bridge pins. Featuring a Red spruce top, solid rosewood back and sides, 2-piece mahogany neck with a soft “V” shape and ebony fretboard, this model delivers warmth and punch with a vintage aesthetic. Other standout and traditional features include the use of hide glue and an authentic bone saddle, nut and bridge pins. Custom Shop solid red spruce top, solid rosewood back and sides. Available in Natural and Sunburst nitrocellulose lacquer finishes. Custom Shop solid red spruce top, solid mahogany back and sides, ebony fingerboard. 12-String orchestra. Available in Natural and Sunburst nitrocellulose lacquer finishes. Custom Shop solid red spruce top, solid rosewood back and sides, ebony fingerboard. 12-String orchestra. Available in Natural and Sunburst nitrocellulose lacquer finishes.